FOR MEN, WOMEN & KIDS COURSES: KRAV MAGA, KARATE & SPECIAL KICKBOXING FITNESS! ADULTS, TEENS, KIDS, FAMILIES & WOMEN’S ONLY CLASSES. Now you can learn from a real 10th DEGREE BLACK BELT! FILL OUT THE FREE NO OBLIGATION PRIVATE LESSON FORM ON ANY PAGE FOR LESSON WITH WITH JOE CORLEY IN PERSON and/or CALL 404-502-3777 with any questions. Visit us to join our Martial Arts Family at 3000 Johnson Ferry Road, Suite 210, in the Center just south of Walmart and the YMCA. 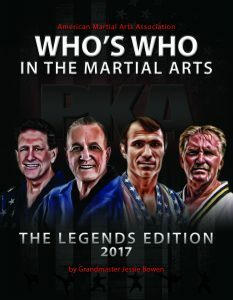 Master Corley, left, was featured on the cover of the Who’s Who in Martial Arts Legends 2017, earning a Lifetime Achievement Award for his competition, television series and instruction history. Master Corley’s classes are age appropriate for Kids 3+ and are really effective for Adult Self Defense, featuring the Warrior Krav Maga curriculum. The Atlanta Extreme Warrior Curriculum includes the principles of more than four decades of Master Joe Corley’s world-renowned instruction: Doing the Right Things, For the Right Reasons and With the Right Principles.